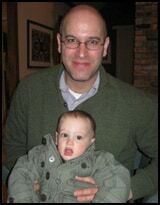 PETER REITZES, MA, CCC-SLP, is President, Host and Co-founder of StutterTalk. Peter has hosted hundreds of StutterTalk episodes, is a person who stutters and an ASHA certified, North Carolina licensed, speech-language pathologist working in an elementary school in Durham, NC and in private practice in Chapel Hill, NC. Mr. Reitzes is author of 50 Great Activities for Children Who Stutter: Lessons, Insights, and Ideas for Therapy Success (PRO-ED) and co-wrote Stuttering: Myths, Beliefs and Straight Talk – a brochure for the Stuttering Foundation. Mr. Reitzes has written numerous articles on stuttering and has taught graduate level stuttering courses at Long Island University, St. John’s University and Touro College. Peter has volunteered for FRIENDS, the National Stuttering Association and the Our Time Theatre Company and was co-facilitator of 2002’s Stutter Across America – a series of eight summer workshops hosted in cities across the United States. Beginning on Episode 421 (September, 2013), Peter began writing and recording music for StutterTalk to use for the podcast.